Episode 21: D X V!! Shun turns to look behind him, "MUH!" He sees a Goddess wearing a Kamui! "You... You are the Olympus God who governs this Paradise...?" giving up on themselves, always trusting in God for the future, and after passing the Purging of Purgatory, gaining Divine Grace can enter..."
Artemis looks carefully at Shun's body. Shun is likened to be naked. His Cloth does not exist. "I was about to praise you, Andromeda, for being able to come here with that wounded body but already, you can't fight anymore... If it wasn't Hades's Brain that got destroyed you would be dead instead..."
"Brain...? You talking about the Brain of the Soul, the Arayashiki of Hades?" "Yes... When Hades possessed you, his soul entered your body and his Brain suppressed yours." Brain to push Hades out!" awakes and suppresses the one that was active before..."
It finally occurs to Shun how Seiya survived the fight with Hades, "After the fight with the Underworld King, Seiya looked like he was dead but in fact, it was only his Brain that was sealed, but his Heart of the Soul was still functioning..."
"Yes... Now you understand Shun... You of all the Saints hate fighting so, don't make me destroy your Heart too..."
"NO! EVEN IF MY BODY AND SOUL IS DESTROYED, I WILL FIGHT! COME! ARTEMIS!!" there, "THEN DIE JUST LIKE YOU SAID!!" The blast of Cosmo is released but right then, Artemis's hand is hit by something! The Cosmo blast does not hit its target! The Olympus God looks at the thing that interfered with her hand! be heard and Shun is surrounded by flames! "DON'T FORGET! MY CLOTH RECIEVED THE BLOOD OF ATHENA... THE BLOOD OF A GODDESS!!" "THAT IS ANDROMEDA'S GOD CLOTH!!" "LET'S GO, ARTEMIS!! NEBULA CHAIN!!!!!!!!!!!!!!" The Square Chain flies toward Artemis and in an instant, her headpiece is blown away, falling to the grass!! "Impossible!! 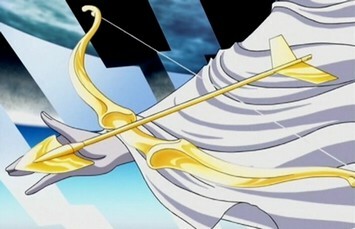 ", shouts the shocked Artemis, "Just wearing his God Cloth, his power has raised to such a level!" Shun retracts his chain ready for the next attack. "As expected, we can't underestimate Athena's Saints..."
"WHAT!? ", shouts the shocked Shun! He is not shouting for the burning Cosmo of Artemis, nor is he shouting for the Cosmo that seems to cover all of Heaven! Shun is shouting because he can see all around him in this Paradise of Hope, darkness is starting to blanket the sky!! The once shining sky is no more and Shun can see stars and space above! But what's more important is in the center, right above Artemis, there is a Moon! A RED MOON!! Artemis shouts, "DARK MOON HEAVEN!!!!!!!!!!!!!!!" "UWAHHHHHHHHHHHHHH!!!!!!!!!! ", screams Shun as the Red Light from the Dark Moon comes to hit him! 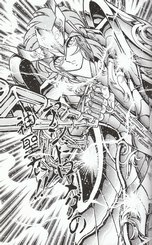 The crimson light blows Shun's body cracking his God Cloth and blood sprays from his body! Shun falls to the grass and stops breathing! 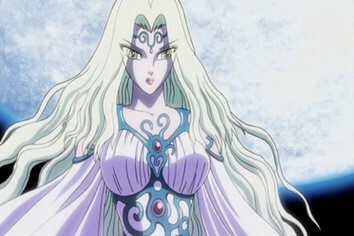 Artemis walks pass Shun's dead body and climbs the steps of her Temple. She was about to enter the temple when the Andromeda Chains on the ground start to move by themselves!! "D X V!? ", wonders Artemis, "What does that mean!?" "WHAT IS THIS!!" comes a voice! Shun has actually woken up! "IMPOSSIBLE!! ", shouts Artemis, "HOW CAN YOU BE ALIVE!!" "My chains protected me! And they gave me a shock to wake me up again! But what is this!!" Studying the chains, Shun wonders, "My chains are telling us a crisis is coming! TO US ALL!!" "A crisis? ", wonders the Olympus Goddess, suddenly it occurs to Artemis! "CAN IT BE!! CAN IT BE!! ...Finally, I understand that weird feeling I had when the 12 Kamui came together! This can only mean!!" The chains starts to wiggle and the letters disappear as the chains return to Shun! Artemis finally calms down and says, "Andromeda... I'm not sure but either way I don't believe it!" "For that to happen it is too soon..."
Shun is silent. He just doesn't understand. "Either way... Rather that is true or not, it's not important, what matters is, will the Earth be saved...?" "AH!? ", reacts Shun, "THEN YOU WILL HELP US STOP ZEUS!!" "No! ", shakes the head of the Moon Goddess, "I didn't say that... But I will tell you a way to save the Earth... But it requires..."
Episode 22: The Ultimate Sacrifice!! "It requires your death..." continues Artemis. the Earth. He will stop this war and he will return the Comet to its proper course..."
"One? You mean someone like me!" "Yes. Andromeda. I know you always hated to fight. I know you want all the hostilities to stop. So, let you be the vessel for the Symbol of Peace. Come... Andromeda..."
Suddenly behind Artemis, an image starts to rise, it is a Round Moon shining a blue light, reflecting the light of the sun! "FULL MOON MYSTERY!!!!!!!!!!!!!!!!!!!!" Bathed in that awesome blue light, Shun's taken away from the Paradise of Hope and he's returned to the Earth. But the sight of the Land shocks Shun. Everything is frozen! All life is trapped in ice! Nothing is living! "Andromeda..." comes a voice from the sky, "You don't want this to continue, do you...? Protect the Earth with your death! Die for this Earth!! PLEASE SHUN!!!!" Right then, from the dark sky, a giant orb of Cosmo is coming, heading for Shun! Shun can dodge it but he doesn't. He lets it come, "If my death can save the Earth, I'm glad to give it... Brother, please understand..."
"Thank you Andromeda...", smiles the Goddess of the Moon. She starts to walk away from her Paradise and starts to head for Zeus Temple to report what just happened. [SANDA- UE--------------BU!!] "KYAHHHHHHHHHHHH!!!!!!!!" screams Artemis who just got hit by the Square Chain traveling in a zigzag motion! Artemis is let fly, crashing to the grass! She looks up and sees Shun appear back in her Paradise, "ANDROMEDA!!" "This kind of Skill won't work on me anymore! ", shouts Shun! "I can't do that anymore! Yes... Once in the Hades War, I was willing to sacrifice myself so Hades could be destroyed, so I asked my Big Brother to kill me... But, now I know... THAT WAS WRONG!!" "How could I be so cruel to ask my Brother to take my life! It was inconsiderate of me and unbecoming for a Saint! Artemis! I'll tell you now! "IF I AM TO SACRIFICE MYSELF, IT IS TO DIE WHILE FIGHTING ZEUS! THAT IS THE REAL SACRIFICE! THAT IS THE ULTIMATE SACRIFICE I CAN MAKE FOR THE EARTH!! Again, the Square Chain flies in a zigzag motion towards Artemis but suddenly, a blinding yellow light shines! "WHAT!? ", shouts Shun as the yellow light destroys the Square Chain completely! Artemis stands back up and finally Shun can identify the source of the yellow light! IT IS FROM A BOW!! [Kyuu] "AH! ", reacts Shun, the Bow shines again! But this time, million lines of yellow light is released! an instant, his Circle Chain is shattered and the lights bombard his body! "UAHHHHHHHHHHHH!!!!!!!!!!! ", this time it is Shun's turn to crash on the grass! "Andromeda...", says Artemis coldly, holding a bow with her left hand, "If it allows, I don't want to use this Bow but..."
Suddenly Artemis realizes there is movement in the air around her, "This Air Current!!" skill, "I, too, don't want to use this!! Artemis! If you come with me to stop Zeus, I'll..."
"Yes. It's a shame that all life on Earth will be destroyed but I can see a New Heaven and a New Earth will come because of Zeus's actions. And, even if the DXV is true, I'm sure we would be stronger and more united if all the evil on the Earth is flushed out!" Suddenly from Artemis's right hand, an Arrow appears! to launch is a combination of those two attacks! I'm sure you will die when this arrow hits your body but can you defeat me before that?" "Like I said, I'm not the man I used to be. I will fight to the end! Athena has already told us about the Nine Sense and finally I understand her true meaning!" power from my constellation to fight, but now I understand that the real Grace of God is to awaken the Nine Sense! "The real Grace is if I reach the Nine Sense and thereby reach the Big Will in my Constellation! If I awake my Nine Sense fully, I can access that power from that section of the universe fully!!" Artemis still has nothing to say instead she positions her arrow in her bow and makes aim for Shun. Shun says to himself, "This Air Current will convert into a Storm!!" "KILLING BLOW! ANDROMEDA!! ", shouts Artemis as a image of a yellow Crescent Moon appears! "RECIEVE THIS! ARTEMIS!! ", shouts Shun as the image of Stars of the Andromeda Constellation shines! THE AIR CURRENT EXPLODES!!!!!!!!!!!! "UWAHHHHHHHHHHHHHHH!!!! ", both scream as the arrow hits Shun's chest and the storm explodes in front of Artemis! Both get blown away and fall down dead! But wait, Artemis has still enough life to take a glance at Shun! Grinning, she says, "An... dromeda... Like I said, you can't go fight..."
The Goddess was about to take her last breath but suddenly, Shun slowly rises up! 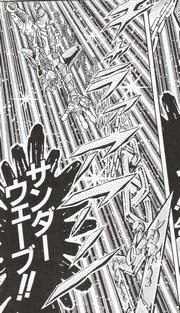 "Kuhhh....", groans the Andromeda Saint, as he raises his right hand and pulls the arrow out of his chest!! Artemis can't believe what just happened and finally falls dead for real. Shun throws away the arrow, and with trembling feet, he starts walking away. Shiryu confronts one of the most creative Gods of Olympus! Finally, the truth about the Formation of the God Cloths is revealed!! Is that the real key to go beyond the Gods or is there more to the story!? Episode 23: Ichor! The Power of the Gods!! 24: Right now! Athena's Gift!! HAVE YOU EVER FELT THE COSMO OF ZEUS!? KIMI WA ZEUSU NO KOSUMO WO KANJITA KOTO GA ARU KA! ?